Founded by co-owners Andree Van Oss and Alex Sirois, Buff & File opened in 2014 and has since grown to a team of 18. 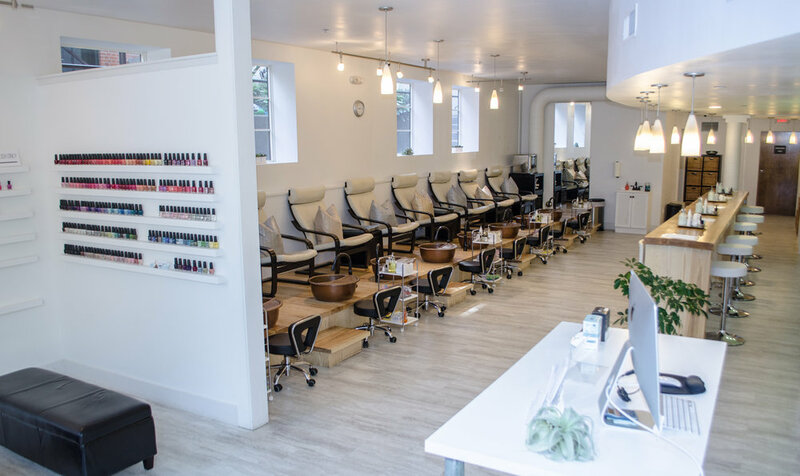 Our nail bar offers a modern mani-pedi experience that strives to be the best nail care on the Seacoast. We offer both non-toxic and gel polishes while stocking the widest possible range of colors. We promise that you will find our nail bar clean, relaxing, and full of choices for both service price points as well as nail color. Buff + File also offers waxing and Flash Facial skin care services in addition to manicures and pedicures. Our non-toxic polishes are free of the most harmful ingredients typically found in nail products: 3-free polishes are formulated without formaldehyde, dibutyl phthalate (DBP), and toluene; 5-free are formulated without formaldehyde resin and camphor as well. Non-toxic lines that we carry include RGB Cosmetics (5-free), Deborah Lippmann (5-free), Essie (3-free), and OPI (3-free). Gel polish cures to an instantly dry finish using skin safe (non-UV) LED lights. We carry OPI gel, Essie gel, and CND Shellac. A gel manicure will keep your nails perfectly polished and shining for up to two weeks. With our full gel service, we offer a 10 day guarantee - if you get a chip, we will repair it free of charge within 10 days. What is The CLEAN Pedicure? We're committed to the overall health of our customers and consider hygiene in our nail bar among our highest priorities. The Clean Pedicure encompasses our use of sterilized and single-use implements, as well as our choice to use non-porous pedicure bowls with no jets. Improper sterilization of tools can risk the spread of disease from customer to customer, while jets in traditional pedicure bowls are extremely difficult to clean effectively, and harmful bacteria easily grows there. Our system allows our customers to relax with the peace of mind that every precaution is taken to protect their health. We recommend that appointments be made in advance so that we are able to accommodate your specific scheduling requests. However, walk-ins are always welcome and we accommodate them as time allows. Due to the high demand for appointments and in an effort to be respectful of our employees’ time, we kindly request at least 24 hours notice when canceling an appointment. When appointments are cancelled with less than 2 hours notice or in the case of a no-show, a charge equal to the full appointment fee may be applied. Thank you for your understanding! appointment may be given away or your service may be shortened to ensure that the next client starts on schedule. All late arrivals are subject to full charge. Cash is always appreciated but we also accept some credit cards (Visa, Mastercard, Discover). We do not accept American Express or personal checks. A gratuity is not included in the price of the service - it is left to the discretion of the client and should be based on personal satisfaction. Gratuity may be paid in cash, or included on your credit card. For parties of 6 or more, a 20% gratuity will be added to each guest's service. No refunds or exchanges on products we sell in the salon. Our $40 gel service includes a 10-day guarantee, so any chips in your gel manicure will be repaired free of charge. We take every measure to ensure a long lasting regular polish manicure, however, due to the impermanent nature of traditional nail polishes and lacquers, we cannot guarantee the lifespan of regular polish manicures. We aim to accommodate each client's wishes for nail art and design within their reserved appointment time. If you would like nail art or designer nails, please specify when booking. For online booking, select your preferred nail art from the options listed under “Advanced Beauty” in addition to your manicure. We kindly remind our guests that you will need to work within the timeframe you have reserved and within the skill set of your technician. We encourage you to bring photos of any desired custom nail art! Unless a staff member is booked by specific request, we reserve the right to move appointments amongst our staff if timing or other service related issues arise. This allows us to provide a consistent high quality experience for all guests. Winter Pedicure Notice: If your service includes a pedicure, please bring your flip flops! It is the only way to ensure your polish does not get smudged before you get home. Alternatively, please allow 20 minutes to sit and dry before putting on your shoes - with or without oil and bags provided here at the salon. Polish smudges due to wearing shoes out of the salon will be fixed for a charge. In order to maintain our high standards of quality, prices and services are subject to change without notice. Gift certificates are transferable, and may be redeemed for product as well as services. Gift certificates are non-refundable. Guests will fully indemnify and hold harmless Buff & File Nail Bar from and against all liabilities, claims, expenses, damages and losses, including legal fees (on an indemnity basis), arising out of or in connection with salon services and/or facilities.